family bike – Lindsey Bikes! This post is part of a series (hopefully) of mothers who ride bikes with their children. If you’re interested in contributing send me an email or reach out on twitter! What does biking with my kids mean to me? Peace, mostly. Before kids, I commuted by bike and would occasionally bike for other errands. It was empowering being self-propelled and fun, as well as much easier (and cheaper) than trying to park near my work. Since I started biking with my kids, these things have continued to be true, but I also started biking for almost everything else as well. For me, it’s just easier, less stressful and overall more peaceful to bike instead. Both of my children have — to greater and lesser extents — hated traveling in the car as babies. My firstborn was so strong, I felt it required excessive force to get her to ‘unplank’ her body to bend into a car seat. My second child would be okay with the car seat, but would wail nonstop in the car after 4pm. Both of these problems went away when we were biking. The first day I picked up my oldest from her daycare/preschool with her baby brother in the box bike was the first day we made the ride home in peace. It was blissful. The stress reduction from this alone would have made the whole thing worthwhile, but there are other ways that biking is more peaceful for me too. With the bike, we don’t get stuck in traffic jams (as long as I remember to avoid Husky Stadium during football games). There is almost always easy parking. We can stop at playgrounds when requested. We can talk while we ride. I can open packets of gummy rabbits or granola bars when requested. Bike naps are a real and lovely thing. I started biking with my daughter on a non-electric Edgerunner, with first a Yepp seat and then just a Hooptie when she got a bit older. I loved that Edgerunner! Just before my son was born, I got a Bullitt with a triple-wide box (to fit a preschooler next to an infant car seat in the box) and front-hub e-assist, in order to be able to carry a baby and also to improve weather protection for both kids. I love the Bullitt even more, mostly due to the canopy on the box. Are you ready to save THOUSANDS of dollars by swapping out your car for a cargo bike? 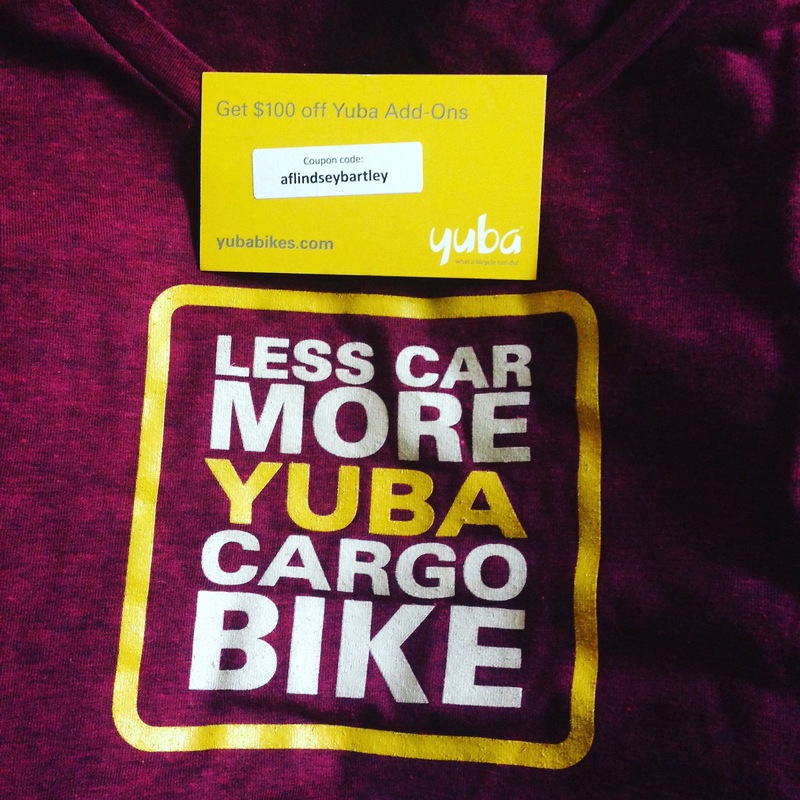 If you’re ready to take the plunge & get a Yuba of your very own I’ve got a code for you! Use the code shown below when you purchase your new bike & get $100 off accessories! I’d personally recommend the bread basket as my top accessory! It’s my go to for tossing in items mid-ride & it’s HUGE. I always get plenty of compliments on my choice of basket! My other must-have is the double kickstand – perfect for large, uneven loads! Not sure you’re quite ready to pull the trigger? Here’s a link to my review of my eBoda. If you’re a part of #bikedc keep your eye out for my floral basket & give me a shout during one of the many events of bike month! *This is an affiliate program & I am compensated if you use my code. This doesn’t change the price of the goods you receive (before discount). You must use the code at the time of bike purchase (purchasing accessories & bike at the same time).